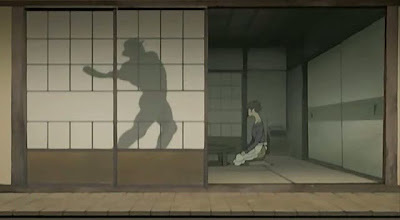 If the first ten episodes of Paranoia Agent have all felt, in their way, like expansions on a single theme, exploring every corner of the world which Kon Satoshi created for his critique of 21st Century life and culture; well, it must be the case that at some point every story begins to contract back down. The resolution is in sight, and the time has come for reigning the series in, and “No Entry” achieves that goal nobly and beautifully, with perhaps a bit too much explicit description of things that had better been left implied and understated; yet for all that, the drama in this, the third episode from the end of the show, is rich and human, and better still, humane: having gone on and on for so long about how miserably broken human society is nowadays, the show suddenly and dramatically takes a swoop into the hopeful: “yes, but…” It is everything that follows that “but…” which makes up the plot of this episode, in which for the first time we find Kon and his animators paying tribute to human endurance rather than sadly shaking their heads at human frailty. Yet frailty there is: it is only a few shots into the episode before we see the face of our newest protagonist, a woman “lit” in such a way to exaggerate the hollows and lines indicating a lifetime of physical battles. 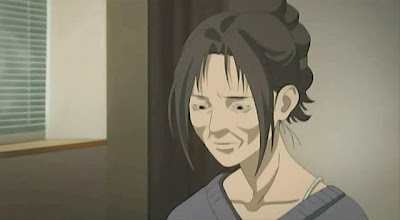 She is, to start with, one of the most elegantly-designed figures in Paranoia Agent; in a series that has played at great length with the line dividing realism from caricature (usually caricatures in the vein of the animal associated with each character, there is something upsettingly realistic about this woman’s design – it is exaggerated just enough to seem all the more true-to-life, and I, for one, find it absolutely impossible not to lose myself in sympathetic weariness. This is Ikari Misae (Komiya Kazue), the wife of detective Ikari Keiichi, who we last saw in episode 7, “MHz”. There, it was quietly stated that several jobs had been lost on account of the mishandling of the Lil’ Slugger case; Ikari’s was one of them, as he now has to shuffle from one construction site to another, working as a security guard. Detective Maniwa was also apparently let go; he’s now lurking around dressed in what I can only call a crazy homeless man’s cape and goggles. But back to Misae. She has just been told that she needs surgery to live; surgery that she cannot afford on Keiichi’s newly abbreviated salary. This is not the first time that she’s been confronted with the present spectre of death in a lifetime of terrible physical ailments, and yet she is scared nonetheless, wondering not for the first time if it might be simply easier to die than keep on fighting. And this is her mood when she arrives home to find Lil’ Slugger. By this point in the series, the viewers and the characters have all come around to the idea that, whatever his precise nature may be, Lil’ Slugger is an embodiment of the human desire to escape troubles: he comes to those in crisis and relieves them of whatever worries they possess, which increasingly has come to mean that he takes their life entirely. Misae has a simpler, more brutal read of his mission – he lets people run away like cowards. And Misae is not one to run away. It is an almost obnoxiously obvious metaphor that the physically weakest character in the series is the one with the most mental fortitude, but there you have it. 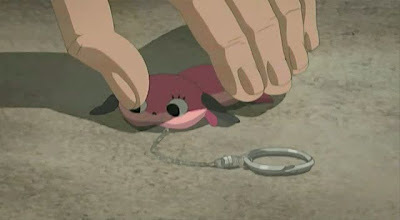 Fully half of the episode consists of just these two talking; or rather, Misae talking in measured tones of her life of pain and suffering, and Lil’ Slugger responding to her, in gleeful anticipation as she seems ready to give in to her miseries, and then in pained confusion as she gathers her wits back around her, saying, “No. I have survived all this, and I will continue to survive”. The obvious symbolism of putting these words into the mouth of a woman as frail as Misae is, as I’ve said, a touch obnoxious; but only superficially. Paranoia Agent has consistently enjoyed what we might call “open symbolism”, in that everything which occurs within the series has a double meaning, but the show is absolutely free with that meaning. The equation of characters to animals is one such form of symbolism; the use of weather, particularly in “Fear of a Direct Hit” and “Mellow Maromi” is another. And note how, from the evidence within “No Entry”, episode 11 actually takes place right around the same time as episode 10, yet the raging storm that marks episode 10 is nowhere to be found here. A continuity gaffe, I thought to myself, but no: for in “Mellow Maromi”, the storm represented Saruta’s anguish, just as clearly as Misae’s words and actions in “No Entry” are very much the opposite: she is clearing the clouds away, and finding a new clarity. This could be witheringly anti-dramatic: a two-hander episode in which one character sits the whole time, and the other keeps raising a bat in the air. 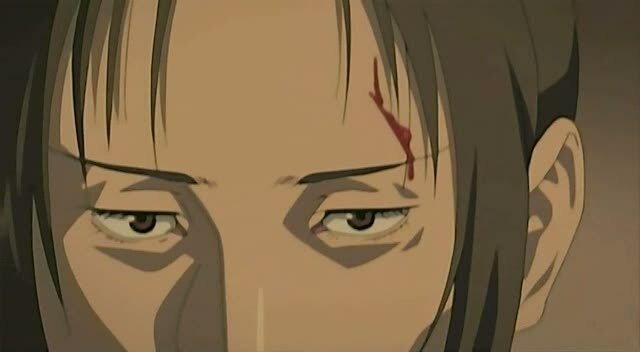 Yet it’s desperately compelling, enough to make the “plottier” half of the episode, in which Ikari Keiichi plods around at his newest posting, meeting a man he once sent to prison, and generally wondering if life has anything left to offer him, almost forgettable. It’s not, of course, and it shouldn’t be: if only because of the telling contrast it makes with the Misae plot. For while the wife finds new strength inside of her to continue braving the world, the husband slowly gives in to self-pity and fantasy. 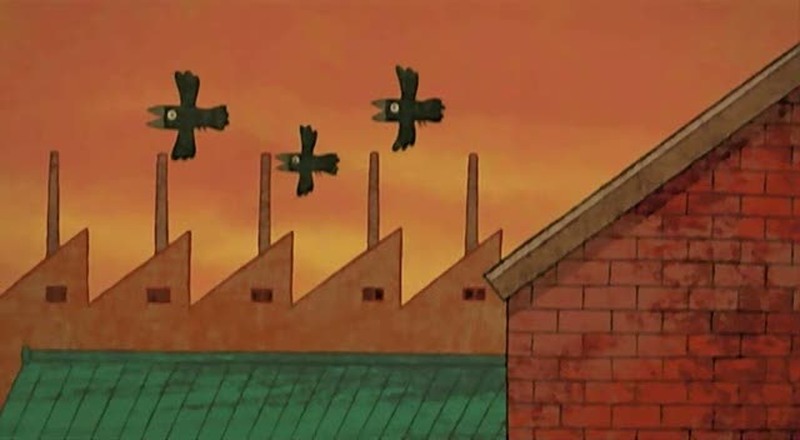 As this happens, he and his plot become less and less detailed in animation, until he enters a fantasy world altogether, in which “animation” hardly seems descriptive of the stiff, cardboard-ey movements of all the people. It’s a cartoon world befitting the cheerful dog Maromi, whom Misae conflates with Lil’ Slugger in a moment I’ve been waiting for all along: they’re both the tools of easy, shallow comfort, promising that none of your problems are real, that anything will go away if you ignore it for long enough. 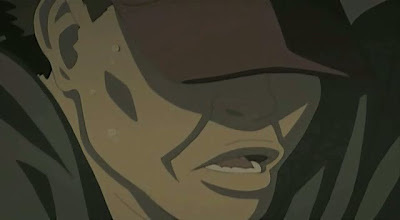 Paranoia Agent has for most of its run shown the deleterious effects of a world in which everyone lives according to that principle; “No Entry” is the bracing counterpoint. Though it is by no means the most exciting, or dramatic, or visionary episode of the series – indeed, it is arguably the most simplistic – “No Entry” nevertheless finds Paranoia Agent at its richest, most emotionally piercing. Paranoia Agent, Episode 10: "Mellow Maromi"
Paranoia Agent, Episode 12: "Radar Man"